MMM I went all out for dinner tonight, I was inspired by the absolutely gorgeous weather, and the fact that other than the mud, it felt like summertime. The kids were outside at 9:30 at their request, came in from 12 until 2 for lunch and a nap for the Princess, then back outside until 5! It was a fantastic way to spend the day. 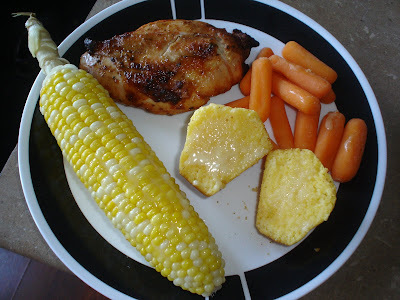 So I made mesquite chicken breast on the bbq, fresh corn on the cob, carrots and homemade cornmeal muffins....my god, was it TASTY LOL. 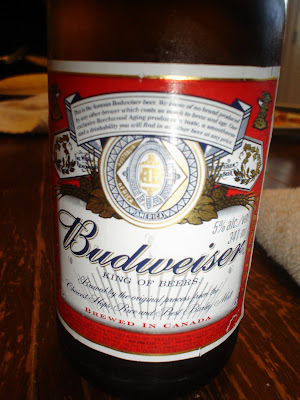 And no bbq is complete without the requisite beer. Good thing we enjoyed it, looks like it will be cooler later this week, so I am glad we lived outside today. I also cleaned out my flowerbeds in the back, got dirt under my nails for the first time in a looong while :) and generally lazed around in the sun. I work the next 3 nights, then 9-1 on Sat/Sun (I LOVE those shifts, hardly feels like I work and I get to spend the whole afternoon with my family, can't beat that) and we have lots of spring cleaning planned as well for the yard and house. Fun fun! Yummy! If you want to give a few of your shifts...you know where to look. I think I'm banned from working or something, or maybe they've just lost my phone number! Yay, BBQ weather is here!